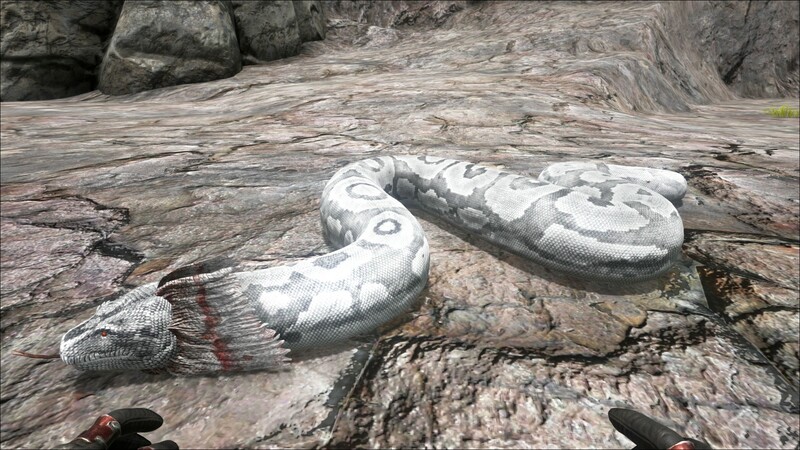 The Titanoboa (Ty-tan-o-bo-ah) is one of the Creatures in ARK: Survival Evolved. Typically found within the Island's caves, Titanoboa exornantur is an aggressive creature that prefers dark, rocky areas. This extremely large snake, while being a member of the Titanoboa family, does not constrict its prey as most boas do. I believe this adaptation comes from coexisting with giant insects. However, the Titanoboa's venomous bite is so potent that it is known to paralyze far larger creatures. Titanoboa has developed a strange coexistence with other creatures of the Island's caves. Being immune to knockout poisons, and being unable to pierce the thick chitin of the insects, the species have learned to coexist. They often hunt large prey together. As they appear immune to knockout poisons, Titanoboa exornantur is basically impossible to render unconscious. Because this crucial step can't be done, I'm convinced that Titanoboa are not tameable. Very aggressive, belligerent and relentless, the Titanoboa will pursue and attack most creatures (except other predators), which includes players who dare to approach one. Caves offer a safe location for Titanoboas to mingle with other creatures. They are also found in swamps, where they will attack whatever they can sink their fangs into. Although not amphibious like the Beelzebufo or the Sarcosuchus, they are adept at swimming. The attack of a Titanoboa increases Torpor, which can neutralize incoming players who are unable to fight this crippling game mechanic. Titanoboa are an important part of the game. They drop eggs that are used to make Titanoboa Kibble, which is used for the Gigantopithecus, the Thylacoleo, and the Dunkleosteus, and they are also used to make Extraordinary Augmented Kibble, which is used for the Managarmr. These eggs are pearly white, so they stand out in a swamp environment. The eggs are incredibly rare, so players often launch egg raids on the swamp. This exposes them to the Titanoboa's deadly attacks, which can foil any egg raid with a few bites. The Titanoboa is a constrictor snake of immense size, dwarfing even the largest anacondas. Thick and bulky, they are found in sizeable numbers in the island's swamps, ambushing prey from the shallows and crushing it between its coils; they are also found in large caves, where their apparent immunity to invertebrate toxins protects them from the caves' other denizens. Their bulk precludes them from the attention of most predators, but if threatened the giant snake will flare a frill about its neck and strike out, biting with several rows of recurved, needle-like teeth. This section displays the Titanoboa's natural colors and regions. For demonstration, the regions below are colored red over an albino Titanoboa. The colored squares shown underneath each region's description are the colors that the Titanoboa will randomly spawn with to provide an overall range of its natural color scheme. Hover your cursor over a color to display its name and ID. 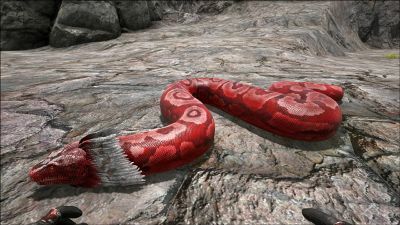 For example, "cheat SetTargetDinoColor 0 6" would color the Titanoboa's "body" magenta. Titanoboa Venom has a chance of 30% to drop. 5The Titanoboa is incapable of drowning. To tame the Titanoboa you have to drop a fertile egg near it, while it is not distracted in any way (it doesn't work if the Titanoboa is aggroed to attacking something, including your character). The Titanoboa will "attack" the egg and eat it, gaining taming progress. The ancestry (e.g. the levels of the parents) of each fertilized egg will not affect the taming speed. The best way is to drop the egg from above while riding a flying mount. But drop the egg from your own inventory, for when you drop the egg from the mount's inventory, the Titanoboa will ignore it. All eggs have to be fertilized, non-fertilized eggs will not work. The eggs in the following tables are representing all egg-types of their group. The other eggs belonging to the same group are listed below the tables. All eggs in a group have the same taming-effects. Once the Titanoboa is tamed, it will only eat eggs as a source of food(similar to the Achatina with vegetable cakes), the eggs do not need to be fertilized. Error: No taming-data for "Titanoboa" found. If the current page is not a creature-page, write the wanted creature as first parameter. Use only the common name, found on the creature's dossier. This section describes how to fight against the Titanoboa. The Titanoboa, although it deals a low amount of damage, is deadly because of its immobilizing venom. Just a single bite increases your torpor at an alarming rate. Their awkward bodies can allow them to climb impossible slopes or stick to ceilings and drop on unsuspecting survivors, so stay wary and keep your weapons equipped. They cannot breed meaning they cant be bonus stats from being partners. The best strategy is distance, stay back and take them down. If you're forced to be within striking distance, it's best to carry some stimulant or Stimberries with you as a combatant against its venom. It should be said that many creatures in the cave can carry Stimberries on them, while this is not ideal it can prove life-saving. Furthermore, shields can prevent further Torpor increase whilst utilising Stimberries. Titanoboas are slow and awkward, so you're better off keeping your distance and peppering them from afar. Their large bodies ensure that shotguns are devastating in the caves or in the swamp and most mounts can ignore the torpor and trounce the Titanoboa soundly. If not too encumbered, simply walking backwards and shoving a spear or pike in their face can usually do the trick. As with most creatures, the hit box is larger than the collision box, so even if it does not make the "smacking sound", the attack still can hit. This tactic also works great for sarcos. Their venom is extremely potent and they're capable of hiding in odd locations. Watch your corners and be ready to run or cover your allies if they are downed but not dead. It is also important to check your surroundings for more dangerous creatures such as sarcos - if you happen to get knocked out, you will be defenseless against any nearby predators. Their large bodies are also a hindrance as they have difficulty fitting through some small gaps. Most tames, even Dimorphodon are quite capable of ignoring the torpor effect and shredding the relatively fragile Titanoboa. They lose melee soundly to an even moderately equipped survivor, providing they beat a hasty retreat before the venom proves their end. They tend to stay next to the bats or scorpions depending on the cave. Despite being common in caves and swamps, they drop prime meat often. However, the prime meat usually spoils before you get out. On the Xbox One, the kill feed misspells Titanoboa as "Titanboa". Information shown on the Spyglass also misspells Titanoboa as "Titanboa." The real Titanoboa was not venomous, instead using its massive coils to crush prey. They did not have frills either, much like the Dilophosaur. Titanoboas have the somewhat unique ability to slither over 1 (possibly 2 depending on the terrain) high walls. This is most likely not a bug, but rather a side effect of them being able to climb up and over the very uneven terrain inside caves which before patch 216.0 was the only place they could be found. Without this ability Titanoboas would quite easily become trapped on the uneven terrain due to their elongated dimensions. Keep this ability in mind if you are building a base near the swamp biome, and consider adding a Wooden Catwalk "lip" to the edge of your walls to stop them from paying an unexpected visit. It is possible to knock out Titanoboa, but you can't tame it if they are knocked out.